Give the freedom to choose! With the Gift Card MagnaParma you always hit the mark. Gift Cards are convenient, original and fast. You can give them to whoever you like. You can use them how when you want. With the Gift Cards you can choose what to buy from over 600 typical products of high quality selected by connoisseurs. Is there a better gift? 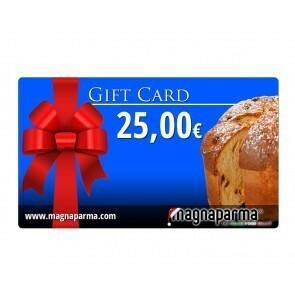 MagnaParma Gift Cards are available in denominations of 25, 50, 100 and 200 euro or personalized amount. Send them to whoever you want and don’t think about it any more!